Independence Day is a great time to celebrate the Cast Iron Renaissance. Here are other folks doing the same! “Shortcut Cooking.” What works better for Asian cooking than a dutch oven? “Cooking With Fire: Campfire Meals Made With Dutch Ovens, Foil Packs.” Includes a number of recipes as well. “Elements: Cast Iron.” Michael Ruhlman talks about his three cast iron pan. “My Beloved Cast Iron Pan.” After seeing Ruhlman’s post on his cast iron pans, Steph is motivated to show off her pan, too. “An easier way season your cast iron + a handy tip!” In yet another Ruhlman-inspired post, Monika Bartyzel tries seasoning on the stove top. “What do you make in a Dutch oven?” Over at chowhound.com, one reader is looking for vegetarian and seafood recipes for use in a dutch oven. 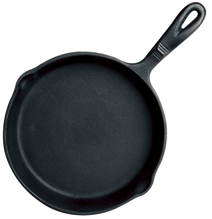 “Cast Iron Cookware.” Another reader at chowhound.com is asking questions about care and restoration of cast iron. “2nd annual Camp Chef Dutch Oven Cook-Off.” July 18, Canyon County Fair, Idaho. “Dutch Oven Cookoff/Cowboy Festival.” Saturday, July 26, Florence Arizona. “Chuck Wagon Dutch Oven Dinner.” Saturday, July 5, Hamblin Park, Evanston, Wyoming. “Dutch Oven Dinner.” July 10, Clinton, Utah. “Cast Iron Cook-Off.” July 15, Eureka, California. “The Heat Is On.” Three stove top grill pans are compared: preseasoned cast iron, enamel-coated cast iron and stainless steel.